The MagicQ PC Wing Compact is an extremely powerful programming and playback wing for use with our Free MagicQ software (Mac, Windows or Linux compatible). 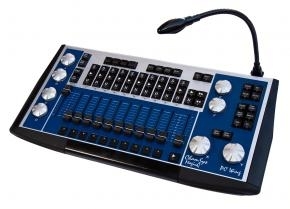 With 2 built in DMX universes, outputting up to 64 universes without the need for additional licenses or dongles, this affordable solution allows you to create a powerful lighting console with the addition of a personal computer. MagicQ supports touch screens, provides inbuilt pixel mapping, both 2D and 3D and a free 8 layer HD Media server and allows advanced control of LED's and all your moving lights. The MagicQ PC Wing Compact provides quick access to moving light parameters via the 8 rotary encoders, and live show control through the 10 playback faders and cue stack control buttons. The MagicQ PC Wing fits within hand luggage restrictions, includes an in-built four port USB hub, in-built power supply and an audio input for cue stack triggering. The MagicQ PC Wing is deal for use by touring Lighting Designers, or for installing into theatres, clubs, and venues. MagicQ PC software is free and uniquely, all 64 DMX universes are are fully enabled. No dongles or licenses to buy. MagicQ is simple and easy to program, enabling really quick setup - you can be up and running your show in minutes. With unrivalled live editing and live timing options, impressive changes can be made live at the touch of a button - no need to spend hours programming complex effects. However, conventional theatre stacks in both tracking and cue-only modes of programming are fully supported. *Free shipping applies only to addresses in the continental 48 states. All others please email for shipping quote before purchasing.